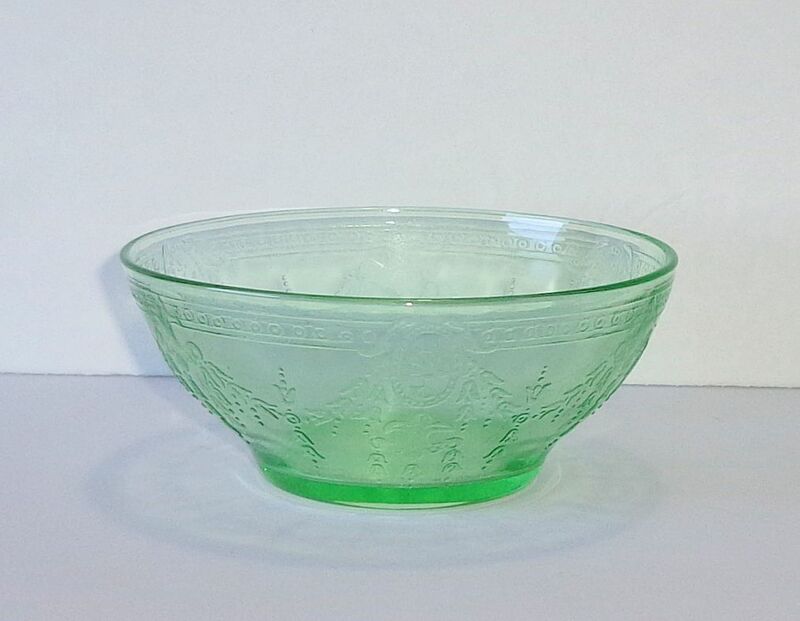 Glass made during the 1930s in the US is often called Depression glass. One of the most interesting types of Depression glass to me is uranium glass. Various glass manufacturers used small amounts of radioactive uranium to achieve yellow (called Vaseline glass,) green, blue and red colors. Uranium was even mixed into milk glass to make a pale yellow Custard glass. 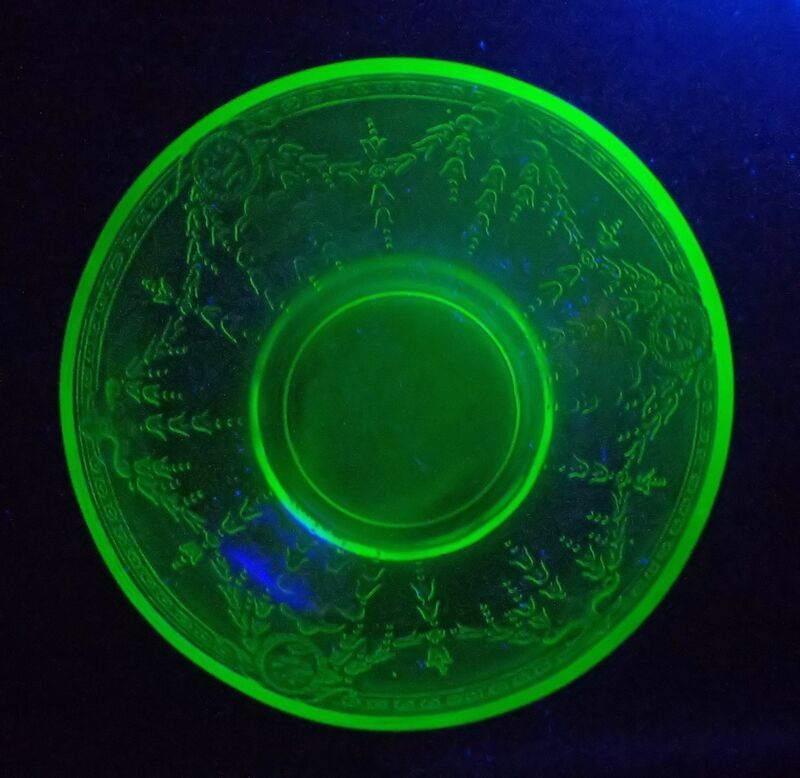 Uranium glass can be identified by viewing it under a black light. It will fluoresce a bright neon green. The glass does emit infinitesimal amounts of radiation. It should not be used to store food or hold highly acidic food. It is safe to handle, eat from and store in the home. This bowl was made by Belmont Tumbler in the 1930s and is the Cameo Rose pattern. The design is embossed on the outside surface of the glass. I found the bowl recently in a thrift store for two dollars. It took me a while to identify the maker. Several companies made similar patterns including Anchor Hocking, Federal, Indiana, Jeannette and MacBeth-Evans. These glass manufacturers competed with each other, hence the similarity. Uranium glass was first made in the mid 19th century in Europe. American glass companies adopted the technique and Vaseline glass, in particular, became quite popular in the 1920s and 30s. The name derives from the resemblance in color to petroleum jelly. The US government forced the curtailment of uranium glass during WWII. Uranium was restricted to government use. Following the end of the war, some companies resumed uranium glass manufacture. Today it can still be found in offerings from companies such as Mosser or Fenton. 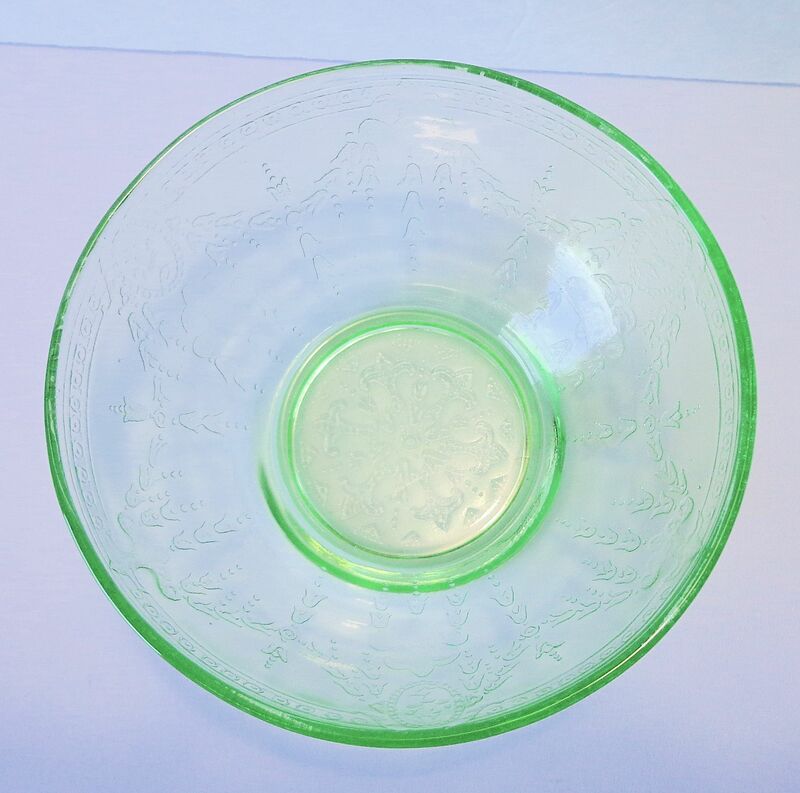 This piece of uranium glass is currently offered in my eBay store. It is valued at around $20, due mostly to its rarity. Update 11/27/16: the bowl shown above sold for the asking price. Currently I have the heavy glass candlestick holder for sale. I’m still researching the maker. Also, the three uranium glass grill plates by L.E. Smith.